Description: Darkrai is a black, shadow-like spirit. 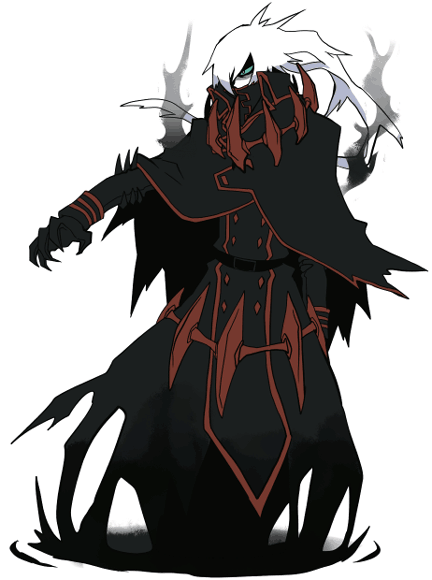 That has taken the form of a tall man, with a old body long ripped black coat with red highlighted décor. A white fog-like ghostly plume billowing from its head covering one of its bright blue eyes, with the portion on its face resembling hair. It also has a red spiky growth around its neck or the collar of the coat. It has skinny arms and long black tatters cape hanging from its shoulders, it also has black, claw-like hands, it has the slight appearance of an hourglass figure and appears to be wearing an o. It normally does not have any sort of legs, but does produce a shadow like tentdrils on the ground. In self-defense, Darkrai can retract its head and white "plume" into the pit atop its torso fringed by the aforementioned red growth. Abilities: Has the ability to morph into a larger humanoid form for battle, making it larger and more terrifying. Description: Darkria is able to release a horrible aura imbued with dark thoughts, this attack is a rather dark one, targeting the foes ability to fight back, making all D rank mages unable to cast spells for two turns. It’s able to be used at mid to close ranges, such as 15 to 10 feet. Causes all D ranked spells to fail. Doesn’t effect spells higher than D.
Requires 3 turns to recharge. Doesn’t affect light base spells. Description: Darkria is able to release a horrible aura imbued with dark thoughts, this attack is a rather dark one, targeting the foes ability to fight back, making all D rank mages unable to cast spells for two turns. This ability is very powerful, the ability to stop people from casting spells will shut down most mages. If you make this ability only hit one target and incress the cooldown, then you can keep it. Just to help with clarity, please put the cooldown and duration separately so other can find it more easily.